Super quick weeknight dinner ! This pasta dish is named after the man that enjoyed it the most ‘Phil’. Phil is new to cooking and wanted some easy pasta dishes. This pasta dish is made using two pots, so there is very little cleaning ! Best part of all, using the power boost setting on my induction cooktop, this meal is ready in about 15 minutes ! Yup – that quick ! 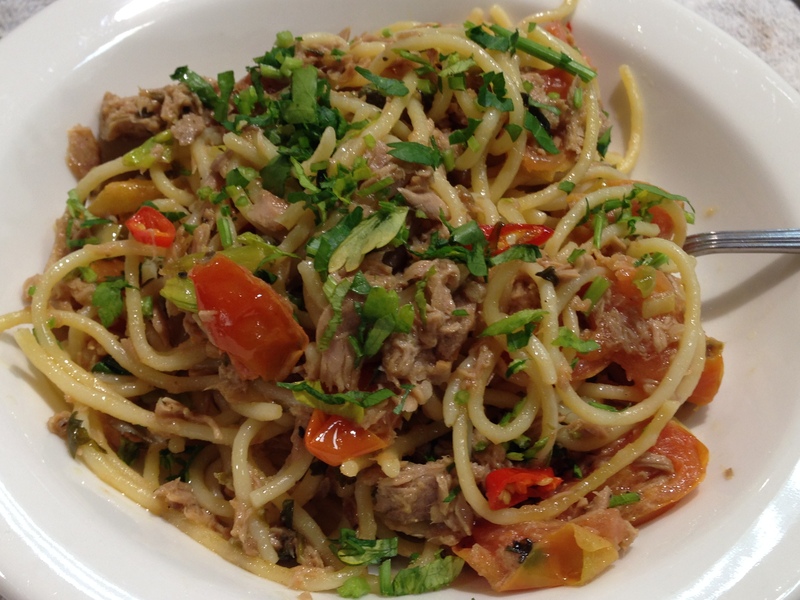 Give this flavour packed tuna pasta a try! Using my induction cooktop this dish is cooked from start to finish in 15 minutes ! 1. In a medium sauce pan place 300mls water and 1tsp salt. Place saucepan onto induction cooktop and select Power Boost setting, bring to the boil. 2. Whilst you are waiting for the water to boil, being to chop tomatoes into quarters, finely chop parsley, chilli, shallot and garlic, use a fork to break up tuna. 3. As soon as the water begins to boil, drop pasta in and stir for 30 seconds, stirring prevents sticking, cook as per packet instructions, use the timer on your induction cooktop. 4. If you hadn’t finished chopping the tasks from step 2, complete those. Set aside 1 pinch of parsley. 5. Place all remaining ingredients including the olive oil from the tuna into a non stick fry pan, sprinkle with salt and pepper, place onto induction cook top to a medium setting, and allow sauce to simmer. 6. Drain pasta, stir pasta through sauce. 7. Divide into 2 bowls, sprinkle with parsley. *if you do not have an induction cook top this recipe will still work, however it will take longer for the water to boil and the pasta to cook, as with inductions speed and power a litre of water boils in a minute and a half. 15 minutes based on pasta that cooks in 9 minutes.